It's the evening of the winter holiday band concert, one of the biggest events in the middle-school year. My 14-year-old twins, Noah and Lydia, are members of the symphonic band. Noah recently presented himself in his school with a different name and gender, socially transitioning from female to male, but I expect he will remain for the evening in his room, where he's spent the greater part of three months curled up in the darkness. He is recovering from clinical depression. The swirling rush of getting Lydia ready for the concert momentarily distracts me from worrying about Noah's school absences. My academically gifted son could potentially flunk eighth grade. We're in limbo. Sometimes Noah will attend school for two or three days in a row. Then, just when I've gotten my hopes up that he's well, he'll regress again for a week. I'm never sure if Noah will have a good day or a bad day, enter normal activities or sleep until dinner. This morning he erupted at me like a geyser when I tried to wake him. I'd thought that since band is his favorite class, and since the concert is tonight, he'd muster up the energy to get out of bed. I was wrong. I pull brownies from the oven for the bake sale, and their aroma fills the house. My husband, Robert, is in the shower. I hear the sound of a ping coming from the living room. Lydia's broken a string on her harp. Not again! I tense, thinking how much time it takes to tie those harp knots. She calls, "Mom, help!" In the next hour, I must prepare dinner, braid Lydia's hair, and pack the large harp into the car. And now, I also have to replace the broken string. Suddenly, Noah appears and asks Lydia if he can borrow her black jeans. "Noah," I say, "are you going to play in the concert?" "Of course," he says, as if he hadn't missed today's rehearsal and at least half the band classes. "I need to borrow one of Dad's ties." I should be overjoyed but in this altogether surprising moment I'm overwhelmed. My brain is slow to process the new plan. And I wonder if Noah will change his mind at the last minute. That's certainly happened. "I'm glad, Noah. We'll have to leave in an hour," I say, wondering if he can get himself ready quickly enough. I consider the band teacher. "But will Ms. Jinni let you jump in?" "I'll deal with her. Don't stress." Noah pauses. "Mom, I'm sorry, I should have told you. Can we stop by a store on the way? I need boys' dress shoes." "Noah! That would take too long!" "We can be late. Our band comes on last." "Lydia needs to get the harp on stage at 7:30." I find my husband: "You take charge of Noah and make sure he has what he needs. I'll take care of Lydia and the harp." The concert marks Noah's first public event as a boy. An important night. I take a breath. I can hardly believe it, after numerous therapy sessions, and months of alone-in-the-dark time, cocoon time, soul-recovery time, Noah's depression appears to be lifting. Is this the healing we've all worked and prayed for? Is Noah bursting back into life? Yet Noah's still emotionally fragile. The way his bandmates, friends, and other parents react to him this evening could influence whether he retreats into his room again—for days or weeks, or maybe until the end of the school year. After a rushed dinner, I glimpse Noah and Robert sorting through Robert's tie rack. Robert displays various striped and patterned neckties. Noah makes a face. "I'm supposed to wear one that's plain and black." How kind Robert is to give Noah his complete attention. Smiling, I take a few minutes to watch them. Robert holds up a dark tie that's ridiculously narrow, out of style. Noah groans. "Dad, no!" There isn't a tie small enough for a boy who is five feet one with a skinny frame, or stylish enough to fit the image of a 14-year-old with gelled, spiky hair. Noah chooses a navy-blue silk tie that's about three and a quarter inches wide, and way too long. At the bathroom mirror, Robert places the tie around Noah's neck. Noah folds and loops it. There's a comic moment: The knot appears flimsy, does not fill the gap between the collar points and, worst of all, the tie extends a few inches below Noah's waist. On the third try, the two ends of the tie, perfectly aligned, reach Noah's belt. There! He looks quite distinguished, in his white shirt and dark tie, Lydia's black jeans, and his high-top black sneakers. His short haircut suits him. He has style, character. I push aside memories of previous concert nights, when Noah was a pretty girl with long blond hair in girls' attire, all black with royal blue hair ribbons. The twins sometimes wore their favorite silver necklaces, pendants of dragons. Against the dark fabric, their hair appeared striking, beautiful—and feminine. I loved having identical twin girls. But Noah's grinning in a way I have not seen in a year. His blond hair has begun to fall a little over his forehead, his cheeks are flushed, and his large eyes are bright. I have a vision of what Noah sees in himself already: A boy… a handsome boy. I'm proud of him for his courage in participating at the concert tonight. And I'm proud of Robert, for accepting that he has a son now, and for adapting fully. An hour later, at school, my husband and I settle into our seats. A nearby parent turns to me and says, "I saw your daughter Margaret in the foyer earlier…What's her new name?" "Noah." I feel my shoulders tense. As I'd suspected, there's been talk in the school community. I'm feeling jittery, out of my comfort zone. She leans forward and places a hand on my shoulder. "She…I mean he…is looking sharp," she says. "Being a boy…It's fine with me, and with everyone." Is it really? Who is everyone? "Thanks," I say. "Appreciate it." I stand, turn to her, and give her a hug. So far, no one in the school community has openly criticized me and, contrary to my fears, I'm starting to realize that both parents and children are accepting my son's new identity. Ms. Jinni, who had apparently foreseen the possibility that Noah might show up at the concert, had even printed his new name in the program. Noah and Lydia sit with their bandmates in the front rows of the auditorium. I am watchful. Is anyone being cruel to Noah? After the jazz bands and the concert band, the symphonic band finally takes the stage. Noah smiles as he parades up the steps with the group of 80 students. The brass of his euphonium glows. Lydia is wearing black like the other girls. She takes her place near the flutes, oboes, and clarinets. She has spiraled a red ribbon up the column of her elegant spruce-and-walnut harp. Noah is in the back with the brass section. Ms. Jinni, stylish in a black dress and heels, strikes the air with her baton. A vigorous brass fanfare opens the piece—and we're off! The symphony movement is The Lord of the Rings, Movement 1: Gandalf by Johan de Meij. It tells J.R.R. Tolkien's story of a wizard, initially known as Gandalf the Grey, who dies in battle, then returns from death, is healed, and dressed in new robes as Gandalf the White. Now, in the music, the old wizard makes a surprise entry, in the way wizards do. There's a whirling invocation of flutes and clarinets, and a majestic theme emerges, gradually climbing in pitch. After a trumpet solo, the woodwinds return for a mysterious melody. I hear Lydia on the harp, plucking a magical mist. And somewhere in the rich, velvety horns, Noah is playing. The audience is regaled with dramatic changes, and the piece ends in a final burst of supernatural power as all instruments join in. The band bows to great applause and joyful cries. Swept up in the beauty of the music, in a feeling of pride for my children, in the sense that magic is indeed possible, I feel tears in my eyes. Without anyone seeing them, I wipe the tears away. In the dark, surrounded by sound, I experience an intimate, solitary moment of releasing sad feelings I'd stored up during the long, empty months when Noah could not get out of bed. Later, Robert and I find Lydia and Noah among a buoyant pack of band members. Noah is energetic and radiant. He's standing straighter, carrying himself with new confidence. As dramatically as lights brighten the dark stage, Noah has arisen. I wonder: Will he leave his room and return to school tomorrow? The next day? Is he over his depression? How long will his joyous mood last? No one, not even Noah, has the answer to these questions. The forces of healing are mysterious. Deep in the inner world of Noah's psyche lies the unknown. I can only conclude that my son coming out as transgender has been for the good, likewise his solitary time away from everyday activities. 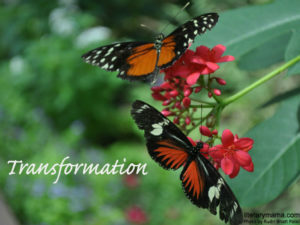 He enveloped himself in a cocoon for a while, and is creating a new life. Like Gandalf the Wizard. Katrin Grace has served as a freelance writer for the National Geographic Society, Scholastic, and Reader’s Digest Young Families. Her personal essays have appeared in Episcopal Café and Motherwell Magazine. Katrin, her husband, and two teenage children live in the Pacific Northwest. Beautifully written. inspirational and moving. Dramatic and true to life, profound and beautifully written. A family to remember and root for, movingly portrayed. Oh what a radiant story full of hope, and all the small craziness of family clutter and love! With the family getting ready for the band concert and Noah having hidden in his room for months, no one could have expected this evening he would be ready to make his own transformation. So his family sent him off with love...and sat back and watched their boy bloom. Moving story and writing! Thank you Patricia, Jane, and Stephanie! As the mother of a trans child, I find so much of this essay rings true. The details might be different, but the essence of the experience is so familiar. I also love the glimpse at father and son. Once you embrace who your child IS (rather than who you think they should be), the whole family transforms. Thanks for this glimpse into a mother's heart. Wishing you well as your and Noah's journey continues. Thank you, Kitty and Jude!